Energy Focus offers LED Lighting solutions for all applications. From hazardous locations to emergency egress lighting, we offer the most diverse range of lighting to complete any retrofit or new construction project. Join our regional sales manager Paul Zock at World Energy Engineering Congress (WEEC) 2018 in Charlotte, North Carolina October 17-19 to see our range of energy efficient LED tubes, luminaires, and more! 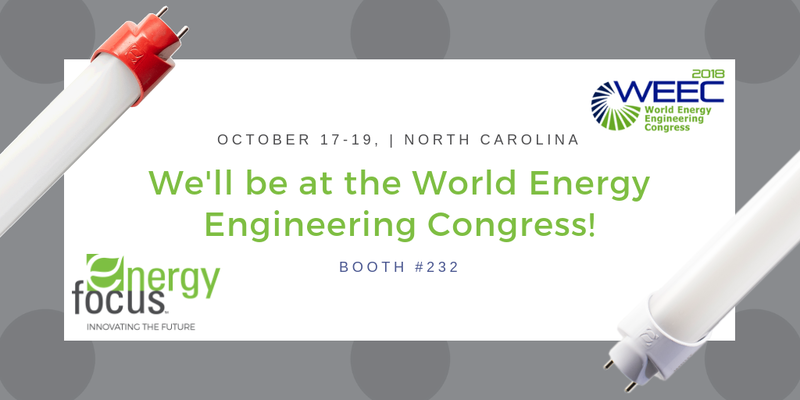 The annual World Energy Engineering Congress is your gateway to the world of today’s most efficient and advanced energy technologies. New to WEEC, is the Greenstreet showcase, the latest sustainable technologies co-presented by the U.S. EPA’s ENERGY STAR®. Join Energy Focus at Booth 232 in the Greenstreet showcase! Experience how to achieve greater energy efficiency, productivity, and wellness in your offices and facilities. Visit WEEC’s website to sign up to attend the event. If you are interested in our products, please contact us.